COMPANY P&P Loyal Ltd are specialists in professional and corporate clothing. We have a track record of over 25 years manufacturing and supplying safe, comfortable, easy-to-wear work clothing and uniforms, and are now a leading presence in the Italian workwear market. P&P Loyal has a dedicated technical team researching garment design solutions from choice of fabric to a comfortable fit to ergonomic considerations allowing easier movement. Our technical specialists can analyze all tender or contract requirements and come up with new fabric specifications including high-tech features and/or special colours. All garments, from Categories II and III down to Category I, are CE labelled, and garments coming into direct contact with the skin also have the OEKO-TEX® logo as being free of harmful substances. Items certified OEKO-TEX® standard 100 Class II comply with current European legislation on the use of azo dyes. 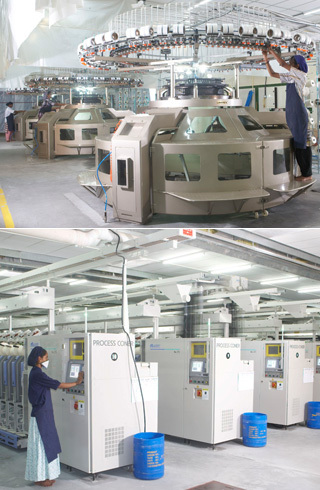 All the garments we distribute are manufactured in our facilities in India. Our state-of-the-art production process starts with the raw cotton fibre, which is spun, woven and dyed and finally transformed into ready-to-wear garments. Careful quality control guarantees customers a product made with the skill and professionalism in which we take pride. P&P Loyal's 3000-sq.m. warehouse uses an efficient racking system for stock storage and rotation. Over 150 standard catalogue items and 2000 codes on 1500 pallet spaces ensure a despatch capacity of 12000 parcels per month. The warehouse staff are aided by a automatic system which ensures that goods are despatched within 24 hours from receipt of order.